Administrative classroom building – 9-storey building where the classrooms, administrative offices, departments, museum, Admissions, library and others. Old school buildings – 4-storey building where the classrooms, administrative offices, a dean, department, laboratory, research pool, Center for Information Technology, dining, etc. 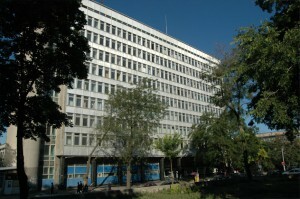 Laboratory Training Corps – 5-storey building where the classrooms, administrative offices, a dean, department, laboratory, wind tunnel and others. Training Corps in lane. Topolskoho, 4-th – Center for Preparatory youth. Laboratory SPSU Department EMS and TE. Pavilion Chair MMT and MNR. Dormitories – Cases 1, 3-8. Joinery workshop and tin shop. Buildings oceanographic laboratory-based aquatic plant. University graduates were prominent people – Minister of the Navy of the USSR T.B. Huzhenko and Chief Black Sea Shipping Company, Hero of Socialist Labor A.E. Danchenko. Recently, the university front columns of the memory of generations “conductors” on their contribution to the development of the maritime industry is marked by a plaque. Glorify his name ONMU famous alumni: former chief port “Yuzhny” full chevalier “Merit” V.G. Ivanov, Academician of the National Academy of Ukraine V.I. Mahnenko, deputies of Ukraine, Hero of Ukraine S.K. Strebko and M.P. Pawluk, known satirist, People’s Artist of Ukraine M. Zhvanetskiy artist and satirist V. Ilchenko, honored artist of Ukraine, soloist of the Kyiv opera H. Krasulya, poet Zabashta Love and many others. Results ranking of the best universities in Ukraine “Compass 2012”: 9th place, overall rating score of 10.